While a few energetic and competent farmers manage to run CSAs by themselves or with only their families and employees, they are missing the opportunities for broader participation and support that CSA offers. Building solidarity has practical advantages and at the same time contributes to deep social transformation. To build a future for ourselves and our communities that is grounded in ecological realities, we need to learn how to live and work together. The Mondragon cooperatives offer us the practice of “equilibrio,” the constant balancing between individual freedom and the needs of the broader community. Whether we take our clues from Rudolf Steiner, Mahatma Gandhi, E.F. Schumacher or Karl Marx, the complexities of moving from the present industrialized, corporate-dominated food system to an “ecological civilization” require the concerted effort of all of our brains, hearts and experiences. To earn its name, a CSA should involve shared risk between farmer and customer, and practical sharing of the important work of producing food. Subscription-style box schemes provide service with customized orders and even home deliveries, but it is really stretching the definition of CSA to include them. While members enjoy full service, farmer initiated CSA projects that do not ask more than payments from members are often structurally weak. Knowing how busy people are and fearing competition, farmers are reluctant to ask too much. All of the work of production, communication and service falls on the farmers placing them at risk for burn out. Next thing you hear is they have taken a job that pays better. Most of the CSAs that are thriving after five years or more rely on active member participation. What is impressive it that no two do this exactly the same way. Among the network of successful CSAs, there are many examples from which farmers or organizers can learn, ranging from farms that recruit members to provide drop-off points to full scale farmer-consumer cooperatives where everybody works. Besides CSAs with member involvement, there are also multi-farm CSAs in which two or more farms cooperate. A few of these are legally established as farmer cooperatives, following the model of Rolling Prairie in Lawrence, Kansas. Just Food in New York City has facilitated the establishment of over 100 CSAs, linking groups of city dwellers with farms within 2 or 3 hours drive. The staff does outreach to community organizations which provide social services and also helps groups of consumers who want to organize core groups. With the support of Just Food, the city core groups establish a relationship with a farm, recruit members, arrange and staff distribution, and often find ways to provide subsidized shares for low-income members. On the CSA section of the Just Food website – www.justfood.org – there are excellent tip sheets on setting up a CSA and you can purchase their comprehensive Tool-kit which covers every imaginable detail a group would need to consider. Multi-farm CSAs tend to rely on sharing tasks among the cooperating farmers, asking less of members. The complexities of organizing themselves to work together seem to exhaust farmers’ cooperative energies. However, joining a group CSA is an excellent way for a new farmer to learn the ropes and then either branch out on her own or stay with the group. Rolling Prairie Farmers Alliance has been operating a multi-farm CSA in Kansas since 1994. The seven farms in Rolling Prairie adopted the legal structure of a farmer-owned cooperative. They got help from the USDA Agricultural Cooperative Service which provides support for groups of farmers who want to form coops, including templates for by-laws and other legal documents. Rolling Prairie CSA has four drop off points serving over 300 households. The coop pays farmer members to perform such tasks as bookkeeping, quality control and overseeing distribution sites. In some years, they offer farm visits and work days, but member labor is not central to this CSA. 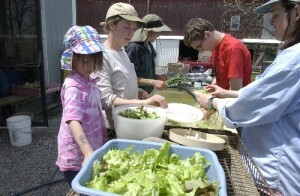 Local Harvest CSA in Concord, New Hampshire, is modeled after Rolling Prairie. 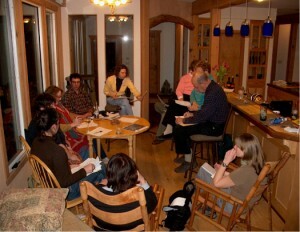 The eight New Hampshire farms spent a year of monthly meetings in 2002 carefully negotiating all the ins and outs of their cooperation. Jill Perry and Scott Franzblau have documented this experience in a detailed guide entitled Local Harvest: A Multi-farm CSA Handbook that is available as a free download from Northeast SARE (www.nesare.org ). Local Harvest covers organization, quality control, crop allocation, and internal and external pricing. 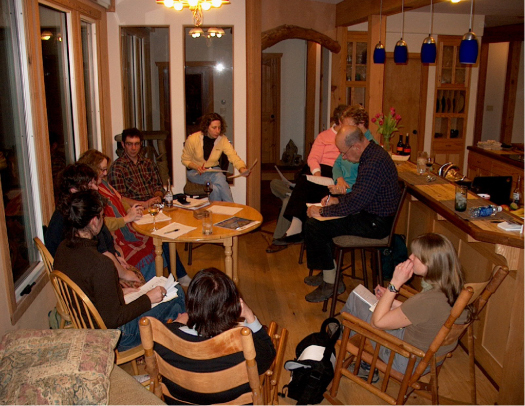 Not all multi-farm CSAs are farmer-owned coops – many associations are less formal. For the Full Plate Collective CSA near Ithaca, NY, two produce farms teamed up to provide the vegetable shares and associated with a livestock farm for meat shares, a bakery for bread, and a youth training program. The Good Food Collective CSA, on the opposite end of the scale from the farmer-consumer coops, is a project of Headwater Foods in Rochester, filling vegetable and fruit shares from eight farms that sell at the South Wedge Farmers Market, supplemented by purchases from other area farms, a bakery and a coffee roaster. They deliver shares to three work places, the farmers market and a yoga school. 1. Open and voluntary membership. 2. Democratic control; one member, one vote. 3. Return of surplus to members. 4. Limited rate of return on investment. 5. Continuous education to members and public. We cultivate a diverse, respectful and caring workplace. We operate with intentional respect for the environment. We commit to financial goals that allow us to maximize our profits in the support of our mission, our values and our community. • David Welty, Book of Procedures for Meetings, Boards, Committees and Officers. • New Society Publishers www.newsociety.com – books on group process and decision making, such as Resource Manual for a Living Revolution, and Democracy in Small Groups. • The New Economics Institute (formerly the E.F. Schumacher Society) in Great Barrington, MA has an entire library devoted to decentrism. • Center for Economic Democracy in Olympia, WA has a collection of basic coop documents. • The National Cooperative Business Association (1401 New York Ave., NW, #510, Washington, DC 20006 provides advice and legal support for cooperatives. • The USDA Agricultural Cooperative Service (USDA-ACS, P.O. Box 96576, Washington, D.C. 2009) provides support services to beginning and existing agricultural cooperatives and publishes a monthly magazine, Farmer Cooperatives, which is free to qualifying organizations. On each of our farms and together as a movement, we need to keep our complex and interrelated goals ever before us. We need not be afraid to look at what we are doing to measure our progress towards our goals, and to compare our day to day behavior with our most cherished values. By cooperating with one another as farmers and by asking a lot of CSA members, we can contribute to creating a solidarity economy based local food systems that are clean, organic and fair, and provide the quality of life we all want for our families, friends and neighbors. Elizabeth Henderson has retired from full time farming at Peacework Farm in Arcadia, New York, but continues to serve on the Genesee Valley Organic CSA core group. She can be reached at elizabethhenderson13@gmail.com, 585-764-8471.